Ever since the Government of India announced the demonetisation of Rs 500 and Rs 1000 banks notes on November 8, 2016, the pros and cons of this move by the government has been the sole topic of discussion to most of us. Ceasing the usage of these notes as a form of legal tender has surely affected our daily routine. It has most definitely has had huge impact on businesses, trade, and many more sectors of the country. The effects of demonetisation cannot be understated. One of the main question unaddressed by many was the impact of demonetisation on the education sector of the country! 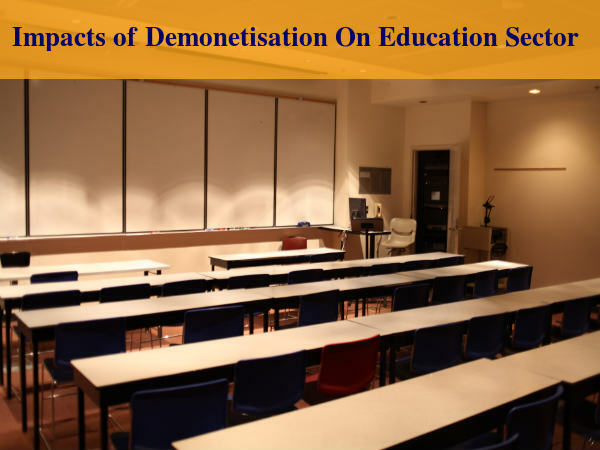 We at Careerindia have put together some interesting views on the effects of this bold move of demonetisation of higher value currency on education. Read the complete story below. The decision of the central government to withdraw high-value bank notes to curb unaccounted cash will hurt education institutions that accept donations or capitation fees for admissions. Accepting and accounting donations will become difficult because of the demonetisation drive. Education sector was not immune to the Indian theory of 'you can buy everything with money'. This move of demonetisation will definitely curb this mentality of many in the country. Nursery admissions, private education institutions and professional higher education including medical and engineering are the segments which accept donations widely. For the first time, these segments are going to feel the impact in a big way. Private educational institutions take huge of amount of donations in Cash which is 40% to 50% more than the fees of the course. We expect that demonetisation will impact the recipient. Admissions in private educational institutions and medical college admissions comes tagged along with donations without a glitch. The donations in medical colleges is usually more than 100% of the fees. Demonetisation will impact both admissions and also the receipt. MBBS seats is some colleges goes for Rs40 lakh to Rs60 lakh, while MD seats has a range of Rs 2 crore price tag on it. Similarly, engineering and management stream seats have a price tag between Rs 2 lakh to Rs 10 lakh each. This move can change the course of expensive education which can be made more affordable devoid of the capitation fee. The seats in the so-called "management quota" will not be up for sale by the institutions, instead will be in the hand of meritorious students. However, some in education sector feel that this effect on capitation will linger may be only for a year or two. After that black money hoarders will find one way or the other like Gold to launder their money into education sector. Some feel that the fee control by state government and no donations may also hinder the quality of institutions. This move may impact the US and UK education market as these are top destinations for Indians and the fees are relatively high in these countries. Some aspirants are of the view that the situation will settle down in six months and if that does not happen, the foreign education plan may get affected for a segment of aspirants. Since unaccounted cash is largely used for living abroad, the situation will worsen if the current atmosphere prevails even after six months. Education-related overseas expenditure was $1.98 billion in 2015-16, according to Reserve Bank of India data and more than 250,000 Indian students were studying abroad at any given point of time. That is it for the education sector. This is how we think demonetisation will affect education system in the country and those who are aspiring to study abroad. Let us know your thoughts in the comments section below.